This weekend, we send you to a little explored corner of the west Big Hole – a hike that, at only 4 miles one-way (and less than 800 feet elevation), is perfect for the whole family! Directions: From Missoula, head south on Highway 93 all the way to the Idaho border. At Lost Trail ski resort, you’ll turn left (east) onto Highway 43 and briefly pass through a corner of Idaho before creeping back into the southwestern part of Montana. Continue on Highway 43 to Wisdom, and then turn south there onto Highway 278 to Jackson Hot Springs. From the hot springs, drive another .4 miles south and then turn right onto Miner Lake Road. At 5.8 miles, cross the Beaverhead-Deerlodge National Forest boundary and then, at 9.8 miles, you’ll enter the Miner Lake Campground. Less than a mile after that you’ll arrive at the loop-shaped trailhead for the Overland Trail. If you’re in a low-clearance vehicle, you’ll need to stop here and walk the rest of the way. This will add 2.8 miles to your trek (in both directions). But for high-clearance vehicles, continue down the rough but passable road to where it ends at the Upper Miner Lakes trailhead. What to expect: Beginning from the Upper Miner Lakes trailhead (2.8 miles from the end of the maintained road): There is no trailhead sign here, but there is one sign with motorized regulations. The trail begins behind this sign, passing around a metal gate and then past a trail register box. This first portion of the trail follows Miner Creek on a fairly wide trail made of packed dirt and loose stones. At 0.25 miles, arrive at a junction with the Continental Divide Trail #9. Continue straight (not across the stream). At 0.5 miles, pass through a large wooden gate designed to keep grazing livestock out of the area. 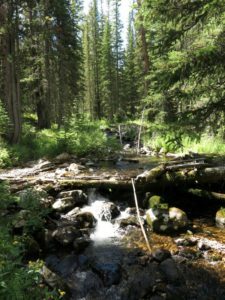 A 1.0 miles, leave the Continental Divide Trail turning left to cross Miner Creek on a narrow but sturdy footbridge. After crossing Miner Creek, gradually ascend this well constructed trail past open slopes and meadows, stopping to enjoy views of the surrounding rocky peaks. Rising from Miner Creek, the forest transitions from lodgepole to a beautiful mix of spruce, subalpine fir, and whitepark pine. Arrive at upper Miner Lake, having climbed only 700 feet over 4 miles to reach this alpine bowl. The lake is surrounded by large rocks perfect for lounging and its clear, deep waters beckon swimmers on a hot summer day.